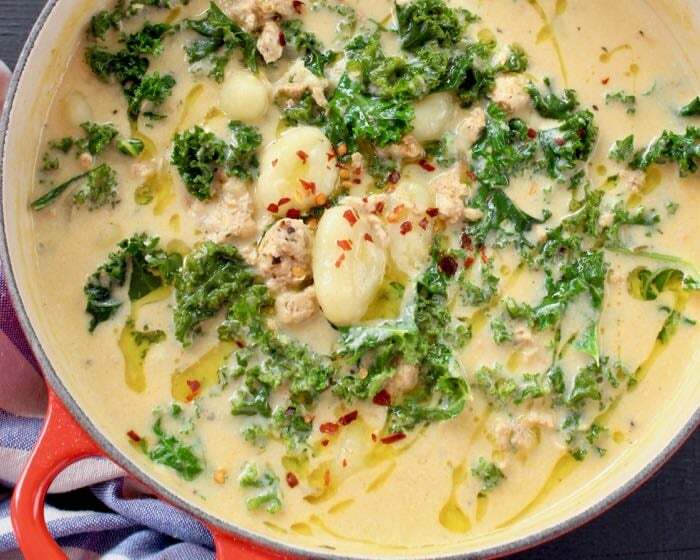 Easy, hearty gnocchi zuppa toscana recipe loaded with Italian chicken sausage, potato gnocchi and kale in a silky creamy broth. Incredibly delicious but not low in calorie. 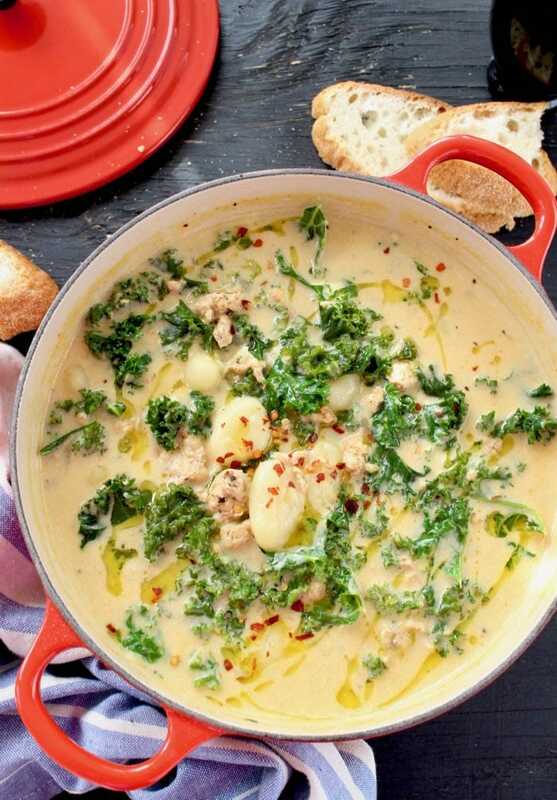 A heavy pot and a slow burner is all you need to whip up this ultimate zuppa Toscana in 30 minutes on the stove top. 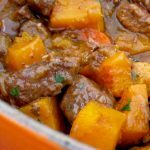 However, you can also make it in the slow cooker/crock pot if you prefer that method. Traditionally made with lacinato kale, this soup is equally delicious with swiss chard or spinach added at the last minute, just enough to wilt from the steam. All you need to do is brown some Italian sausage, saute some onions and garlic then simmer together in a light broth with potatoes, gnocchi or tortellini. 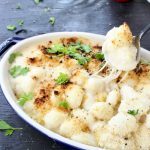 If you wanted to go the healthier route you could add cauliflower or beans instead. And If you want to stay vegetarian, replace the sausage in the recipe with wild mushrooms. What make this Zuppa Toscana recipe the ultimate recipe, is the addition of heavy cream lightly whipped together with egg yolks. No bacon or pancetta is needed here at all, just some crusty loaf and an appetite. As delicious as this soup is, I would beg to argue that this is not a traditional Tuscan soup like a Tuscan Ribollita or this Italian Vegetable Soup for instance, but more of an American creation using traditional Tuscan ingredients, like the Italian sausage, garlic and kale. Mangia Bene! You guys: Olive Garden doesn’t have a thing on this Zuppa Toscana Recipe! Just try it for yourself! 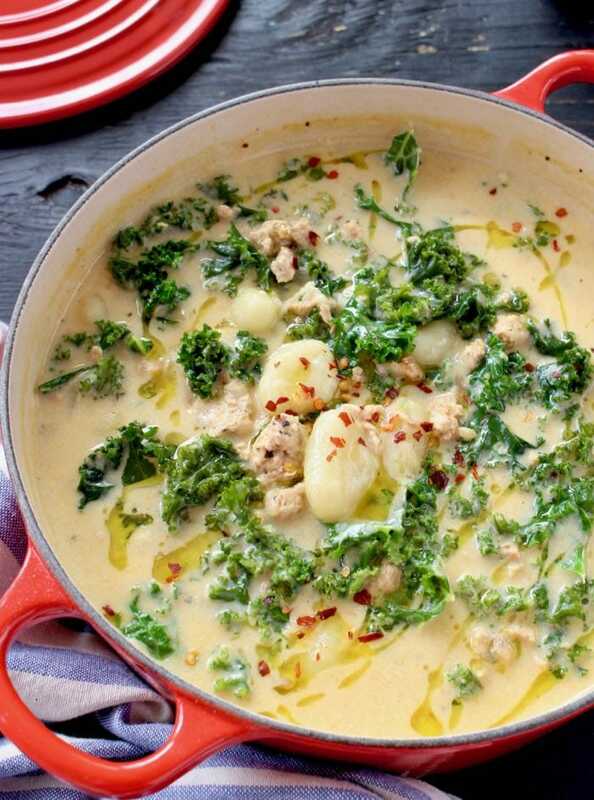 Easy, hearty zuppa toscana recipe loaded with Italian chicken sausage, potato gnocchi and kale in a silky creamy broth. Add a lug of olive oil to a heavy bottom soup pot and brown the Italian sausage for a few minutes on medium low flame. Use a slotted spoon to transfer it to a bowl and keep warm. Add the onion with a pinch of sea salt to the pot with the sausage drippings and saute for about 10 minutes until translucent. Stir in the garlic, red pepper flakes and give it a good stir. Add the 2 tablespoons of butter and allow it to melt. Add the flour and whisk well until incorporated with the oils. Whisk in the vegetable stock and bring to a gentle simmer. Add the sausage back into the soup together with the kale or spinach and stir to combine. 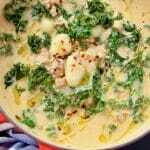 In a small bowl whisk together the heavy cream and the egg yolks then gently pour the mixture in the zuppa toscana. Simmer gently for 3 minutes until heated through. Taste and adjust seasonings with more sea salt. Serve hot with a drizzle of extra virgin olive oil on top, extra red pepper flakes and crusty bread on the side. 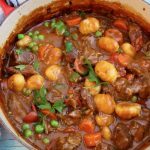 This is such a hearty soup, enough to feed 8 people. 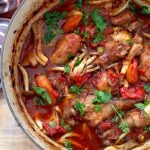 The flavors are fantastic, I used a little more broth than the recipe calls for and it was perfect! This recipe looks so good, but I cannot bring myself to use heavy cream due to the fat content. Do you have any alternatives that I could try? I know that it would change the taste of the wonderfully delicious looking soup… but for health reasons, I can’t use heavy cream. I love so many of your recipes… thank you for sharing them with us. Thank you very much for your quick response! I will definitely let you know if I make it this way. Made this soup today and it was great. I used homemade chicken broth instead of vegetable. Also used spinach as suggested because I had no kale. The soup was amazing! Next time I will be making a double batch!